Updated Monday July 16, 2018 by Beth Jones. 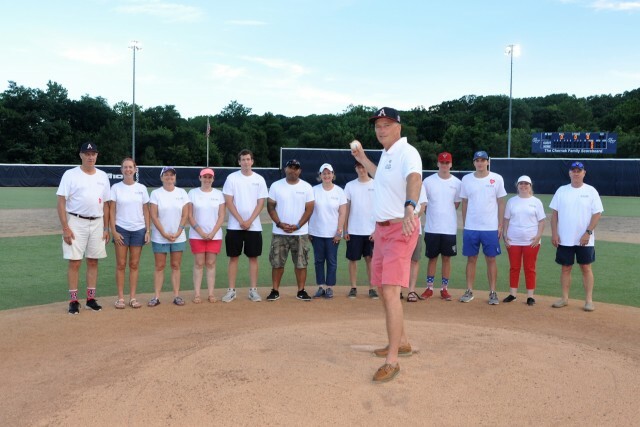 Arlington Senior Babe Ruth Baseball was honored to share the diamond with Admiral James A. "Sandy" Winnefeld, Jr, who threw out the ceremonial first pitch prior to the first Arlington game of the tournament. The Winnefeld's youngest son, Jonathan, shared his love of baseball with his parents, Sandy and Mary, during the many years he played for both Washington-Lee High School and with Arlington Babe Ruth. He too had the thrill of playing in a state tournament. Mary and Sandy Winnefeld founded S.A.F.E. Project US (Stop the Addiction Fatality Epidemic) with its unique six lines of operation to honor Jonathan's life after he died from an accidental overdose last September. It was on the third morning of his freshman year in college and Jon had recently completed 16 months of residential treatment for depression, anxiety and drug addiction, during which he also achieved his EMT certification and charted a career path to help youngsters prioritize their own health and well-being. No one who loved Jon knew he had relapsed, and certainly not with heroin. By all accounts, including his own - as he described in his poignant freshman essay - Jonathan was planning to live a long, clean life of service to others. Sandy served 37 years in the U.S. Navy and is a former Vice-Chair of the Joint Chiefs of Staff. He is highly regarded as one of our nation’s most valued decision-makers. Mary is particularly well-known amongst military and veteran families, whose health and welfare for which she actively advocates. Like countless others who have lost loved ones to the heroin/opioid epidemic, the Winnefelds wanted action taken to prevent other families from being torn apart and bereaved. To that end, they openly discuss Jon's struggles with mental health problems and drug addiction to help illuminate the deadly issues of opioid addiction, help drive solutions in response to the epidemic, lower the stigma of addiction, and carry Jon’s life goal of service to others. Since announcing their mission, the Winnefelds have tirelessly engaged hundreds of families and community leaders including healthcare professionals, law enforcement, education and church groups to coordinate action, and built business collaborations with the high-tech industry to develop an essential technical solution, and spent hours speaking with families across the country who share their experience of loss and pain. “If we can save one life…,” Sandy and Mary say every day, underlining the mission of S.A.F.E. Project, their love for Jonathan, and the personal sacrifice emblematic of their decades-long- career in military service.